* Burton Mutual AA, Trent and Mersey Canal, Shobnall to Dallow, Staffs. Sat, 72. Dave Horton (Browning Lifestyle) 8-12-0, roach, poled bread, squatt and hempseed, three below Dallow Lock; Anthony Marsden (Sam’s Tackle Wigan) 8-4-0; Danny Martin (Sam’s Tackle Wigan) and Stef Johanson (Team Eclipse) both 7-12-0; Dave Richards (Team GB Four Ashes Rejects) and Roger Priestley (Maver North West) both 7-8-0. Caldecoat (Willow Grange) 31-8-0; Nick Larkin (Nisa Feeders) 26-2-0. Sun, 44. 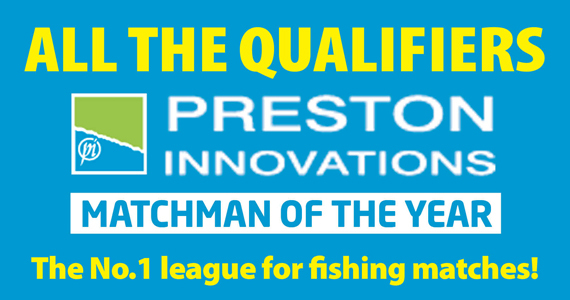 Lee Kerry (Preston Innovations/Ultima Barnsley) 31-10-0, roach to 12 oz, maggot and caster over groundbait and caster, peg 53 in Roach Bay; Robert Hubbard (Daiwa Angling Direct) 31-4-0; Paul Hudson (Deben) 27-12-0; Paul Abbott (Deben) 22-10-0; Reg Bryanton (Deben ) 22-6-0; Chris Smith (Norwich) 21-2-0. Overall: Steve Clarke (Maver Image) 100-12-0; Andy Wilson-Sutter (Great Yarmouth) 58-4-0; Lee Kerry (Prestons) 56-6-0; Mick Mirgaux (Deben) 55-2-0; Kevin Humphrey (Daiwa Angling Direct) 54-10-0; Martin Caldecoat (Willow Grange) 48-0-0. £700 raised for East Anglian Air Ambulance. * Sensas Challenge, North Level Drain, Tydd Gote, Cambs. Sun, 35, Round One. James Drakulic (Maver Image) 34-3-0, bream and skimmers, slider and maggot/caster/chopped worm near the pumps; Arnie Palmer (Sensas Mark One White) 19-3-0; Phil Chesterton (Maver Bait-Tech) and Kye Jerome (Browning Hot Rods) both 14-1-8; Ian Benton (Stanjay Sports) 13-14-0; Simon Colclough (Maver Image) 10-2-0. * Westwood Lakes, Wyberton, Boston, Lincs. Sun, 40, £1000 Qualifier, Paul Harsley (Dave’s Peg) 119-6-0, carp to 5 lb, F1s to 2 lb, poled pellet; Richard Bond (Bury St Edmunds) 104-12-0; Steve Reid (Garbolino RAF) 104-6-0; Pete Rayner (Millview Tackle) 84-14-0; Sean Higginbottom (Maver/Bait-Tech) 72-8-0. 2 lb, worm & corn, 13m, peg 18; Mark Pollard (Shimano Stanjay) 100-13-0; Neil Parkinson (Dynamite Middy) 96-8-0; Simon Wheeler (Daiwa Dynamite) 76-5-0; Jamie Thompson (Cross Drove) 75-12-0; Adam Randell (Stanjays) 71-2-0. Decoy Lakes , Whittlesey, Cambridgeshire, Tues. Beastie Lake , 15. Chris Neal (Rutlanders) 144-0-0, carp, poled paste, peg 13; Tony Dawson (Bait Tech) 140-2-0; Smug Smalley (Decoy) 134-5-0; Jay Richardson (Decoy) 121-5-0. Sat. Yew Lake , 17. Simon Dow (Decoy) 189-10-0, carp to 8 lb, poled cat meat, peg 12; Kevin Wadge (Decoy) 184-10-0; Roy Wells (Decoy) 148-2-0; Danny Carlton (Decoy) 140-14-0. Sun. Six Islands , 17. Simon Godfrey (Decoy) 201-6-0, carp to 7 lb and F1s, poled pellet, peg 25; Alan Tuck (Angling Direct) 157-12-0; Danny Carlton (Decoy) 142-3-0; Rob Goodson (JV AC) 134-15-0. East Delph Lakes, Whittlesey, Cambridgeshire, Sun. 18. Ian Frith ( East Delph Lakes ) 160-0-0, carp to 8 lb, poled meat and sweetcorn; Cam Marshall ( East Delph Lakes ) 111-0-0; Jim Garrity ( East Delph Lakes ) 85-8-0. Foston Lakes , Match Lakes , Lincolnshire , Wed. 11. Terry Crouch (Newark) 215-0-0, carp to 13 lb, floating bread, Hawthorn 13; Paul Kimberley (Team Zimba) 143-0-0; Chris Mawer (Nightingale AC) 134-8-0; Lennie Burton (Mansfield) 113-8-0; graham Eden (Mansfield) 85-4-0; Jason Mills (Newark) 77-4-0. Sat. 18. Ian Palfreeman (Phil’s Bait and Tackle) 266-0-0, carp to 9 lb, floating dog biscuit, Ash 9; Terry Marshall (Dynamite Baits) 159-8-0; Graham Eden (Mansfield) 155-4-0; Pete Johnson (Carlton) 104-2-0; Paul Arndt (Grantham) 101-4-0; Dougie Jackson (Ollerton) 83-0-0. Graham’s Pond, Huntingdon, Cambridgeshire, Sat. 10. Nick Ohlemann (Graham’s Pond) 11-13-0, mixed catch, poled maggot, peg 9; Nigel Marshall (Graham’s Pond) 9-5-0; Ian Thornton (Graham’s Pond) 7-9-0. (Shipshape Tackle) 120-12-0. Sun, 10. Carl Gifford (Suffolks Finest) 108-10-0, carp from margins, Trev’s peg 53; Vic German (Fred’s Match Group) 107-12-0; Ricky James (Southery) 100-7-0. Lakeview Fishery, Holwell, Melton Mowbray, Leicestershire, Sun. Canal , Serpent and Lagoon Pools, 30. Kevin Kania (Avanti Used Tackle) 156-1-0, carp to 6 lb and silver fish, poled dead maggot, Serpent 2; Chris Neal (Rutlanders) 144-1-0; Ken Daws (Sensas) 114-7-0; Danny Higgins (Subfish Tackle) 95-10-0; B. Gray (Lakeview Select) 90-10-0; Tom Neal (Rutlanders ) 79-15-0. Long Eaton Federation Summer League, Final, Erewash Canal , Gallows, Ilkeston, Derbyshire, Sat. 21. Mark Wain (Matlock AC) 6-6-0, a 4 lb bream, small perch and rudd, poled worm, four below Gallows Lock; Will Sully (Long Eaton federation) 6-0-0; Asa Cooper (Matlock AC) 5-15-0; Derek Hicklin (Middleton AS) 5-12-0; Alan Wright (Long Eaton Federation) 4-14-0; Frank Posiak (Kingsway) 4-7-0. Market Rasen AA, Hacketts Fishery, Holme Pierrepont, Nottinghamshire, Fri. 13. Mark Critcher (Market Rasen AA) 81-13-0, carp and skimmers, feeder and pellet waggler, peg 16; Gary Smith ( Nottingham ) 74-2-0; Roy Bentley (Market Rasen AA) 65-6-0. Railway Lake, nr Norwich. Sat, 16. 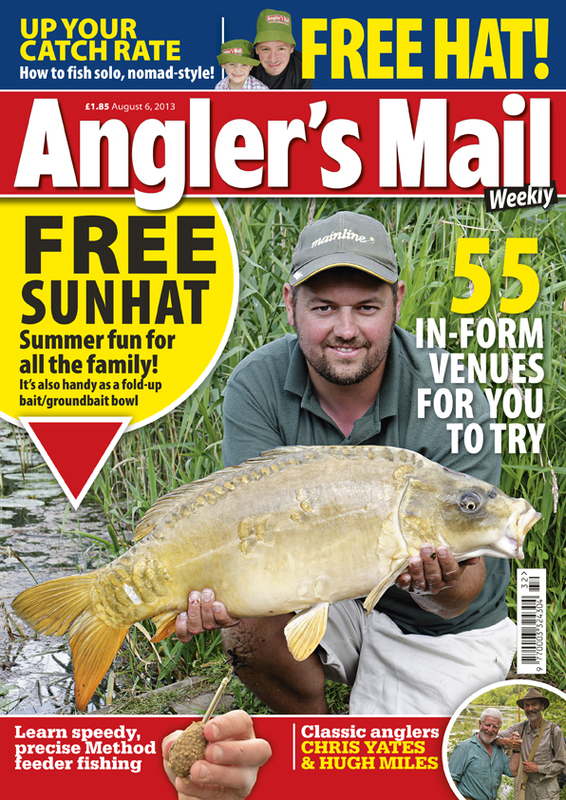 Jason Forster (Norwich) 138-8-0, pellet feeder & bandied pellet, peg 48; Matt Wiles (Attleborough MG) 137-10-0; Ray King (Barford Tackle) 104-8-0; Alan Tuck (Van den Eynde Angling Direct) 96-11-0. Sherwood Forest Farm Park, Edwinstowe, Nottinghamshire, Sun. 21. Martyn Brown (Eastwood Angling Centre) 275-6-0, 48 carp, poled paste, peg 39, new match record; Danny Crewe (Mansfield Piscatorial AS) 159-15-0; Jake Hemmings (Crown Inn AC) 157-8-0; Marc Haywood (Eastwood Angling Centre) 104-12-0; Andrew Keeling (Sherwood Forest Fishery) 90-0-0; Pete Hodgetts (Sherwood Forest Fishery) 89-3-0. Wed. Fun League, Holmedale Lake , 24. Steve Keyworth (Sherwood Forest Fishery) 169-2-0, over fifty carp to 7 lb, poled paste, peg 36; daz Staley (Subfish Tackle) 167-6-0; Martyn Brown (Eastwood angling centre) 160-11-0; Kevin Chaplin (Sherwood Forest Fishery) 137-8-0; Pete Hodgetts (Sherwood forest Fishery) 108-11-0; Kristian Powers (Sherwood Forest Fishery) 107-4-0. Final Placings: Martyn Brown (Eastwood Angling Centre) 59; Andy Lakey (Worksop Angling Supplies) 53; Matt Malia (Wickersley Angling) 52. Westwood Lakes, Wyberton, Lincolnshire. Tues, £100 Qualifier, Skylark Lake, 35. Stewart Bracey (Shimano Dynamite Baits) 116-8-0, carp, F1s, barbel and tench, poled worm and caster, peg 22; Mick Smith (Mansfield) 98-6-0; Ken Clarke (Westwood Lakes) 97-12-0; Graham Young (Westwood Lakes) 96-0-0; Paul Ogelsbee (Westwood Lakes) 92-14-0; Brian Thompson (Westwood Lakes) 86-12-0. Thurs, Over 50s, Skylark Lake, 38. Dave Wilson (Church Warsop Miners) 104-14-0, carp, barbel and tench, poled worm and caster, peg 12; Ken Clarke (Westwood Lakes) 94-12-0; Spike Milligan (Garbolino/Lincs County) 89-12-0; Steve Gregory (Middy/Miracle Baits) 88-2-0; Pete White (Westwood Lakes) 84-14-0.